Looking For Vision Correction Alternatives? The doctors at our Atkinson Eye Care have extensive experience in the pre-operative evaluation and post-operative care of LASIK and other vision correction procedures. 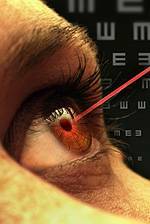 As with any procedure, LASIK can have some side effects. Speak to our optometrsit about Dry Eye and other issues that can arrise, before your surgery.